Existing multithreaded network processors architecture with multiple processing engines (PEs), aims at taking advantage of blocked multithreading technique which executes instructions of different user-defined threads in the same PE pipeline, in explicit and interleave way. Multiple PEs, each of which is a multithreaded processor core, process several packets in parallel to hide long memory access latency. Most of them are optimized for throughputs mostly in data-plane. In future network workloads, the boundaries between data-plane and control-plane become blurred, so that PEs are demanded not only wire speed packet forwarding on data-plane, but also highly intelligent and increased complex packet processing function on control-plane. 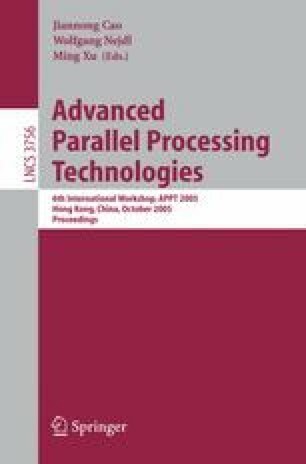 In this paper, we analyze SMT’s short latency tolerance potential when used in out-of-order and dynamic scheduling PE cores. We show in this paper that 2~4 issue SMT provides an excellent short memory and branch latency tolerance, which gain higher instructions throughout as well as much simpler structures.